This multi purpose stacking chair from Jemini is a comfortable, durable choice for offices, meeting rooms, reception areas and more. 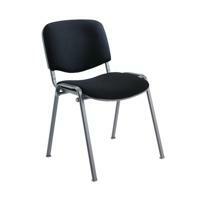 It features a soft charcoal upholstered seat and back with a sturdy black metal frame for durability. The chairs can be stacked when not in use to save space - ideal for occasional conferences and meetings. Optional arms and a folding writing tablet are available separately for even more versatility.